Description Describes dermoscopyThe examination of [skin lesions] with a 'dermatoscope'. This traditionally consists of a magnifier (typically x10), a non-polarised light source, a transparent plate and a liquid medium between the instrument and the skin, and allows inspection of skin lesions unobstructed by skin surface reflections. Modern dermatoscopes dispense with the use of liquid medium and instead use polarised light to cancel out skin surface reflections. criteriameasure of how well one variable or set of variables predicts an outcome of blue neviThis glossary term has not yet been described. Blue nevus, Naevus bleu, Combined nevus Blue nevi – cite! Blue nevi (message) Blue nevi – participate! Blue nevusis a type of melanocytic nevus that clinically and dermoscopically will appear blue also known as "blue neuronevus", "dermal melanocytoma", and "nevus bleu" is a type of melanocyticThis glossary term has not yet been described. nevusThis glossary term has not yet been described.. The blue colour is caused by the melanin pigment being deeper in the skin than in ordinary nevi. Blue nevus commonly arise in adulthood but in some cases they are present at birth or during the first year of life. Diffuse melanocytosis are clinical variants of blue nevi characterized by the development of blue diffuse pigmentation, many years after birth, on the faceis a central body region of sense and is also very central in the expression of emotion among humans and among numerous other species. 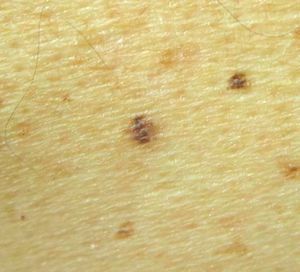 (Ota nevus), on the trunk or arms (Ito nevus), on the sacrum area (Mongolian spot). A blue nevusis a type of melanocytic nevus that clinically and dermoscopically will appear blue presents a regular form, homogenously pigmented (blue to brownish-blue, grey-blue or black-blue) lesions. They can be macules, papules, plaques or nodules. Dermoscopic features of blue nevus are defined by a homogeneous patternA pattern lacking any definable pigment structures, structureless pattern with homogeneous blue pigmentation and complete lack of other features such as pigment networkThis glossary term has not yet been described. or black/brown dots or globules within the lesion. The absence of local features and the presence of a well-defined border are suggestive of blue nevus in contrast to primary melanomaThis glossary term has not yet been described.. Homogeneous blue pigmentation is the dermoscopic hallmark of blue nevi but in some exceptional cases they may exhibit blue globulesclods blue small and dotsDots are small, round structures of less than 0.1 mm in diameter that have a red color when corresponding to blood vessels; however, when due to melanin, their color ranges from black, brown, to blue-gray depending on the depth and concentration of the melanin in the skin (Tyndall effect).. 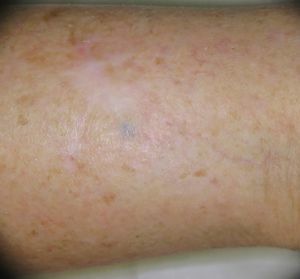 The presence of fibrosis in sclerotic type blue nevus can be seen as a hypo pigmented area with whitish or grey coloration. On the face, perifollicular blue/brown hyperpigmentation can also be seen associated with the homogeneous blue pigmentation. A combined nevusBenign nevus with 2 different cell population in the same lesion. 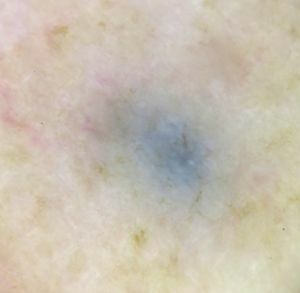 Most frequently this refers to a junctional nevua in associatoin with a blue nevus with a blue nevus component and a dermal nevus component shows a characteristic image with brown homogeneous pigmentation associated with blue homogeneous pigmentation in the same lesion. In blue and combined nevus streakslines radial (always at periphery) streaks Reed nevus melanoma recurrent nevus at the periphery can be seen by the presence of radially oriented bundles of melanocytic cells or melanin-laden macrophages. In contrast with the streaks at the periphery of melanoma or Spitzoid/Reed type melanocytic lesions in blue nevus these structuresThis glossary term has not yet been described. show a slate-blue pigmentation and are out of focus due to their depth. 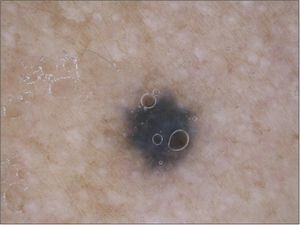 In the nevus of Ota and nevus of Ito a diffuse irregular blue-brownish pigmentation is the main dermoscopic feature. 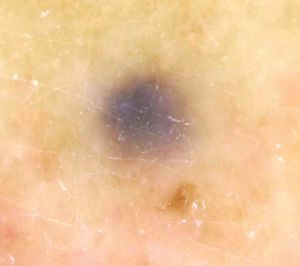 Some nodular melanomas and malignant blue nevus can clinically and dermoscopically resemble a blue nevus. In the case of the malignant tumours the diameter is usually larger due to their fast growth. 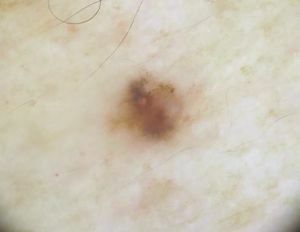 A subtype of melanoma epidermotropic metastasis are undistinguishable of blue nevus due to the pigmentation at the dermal level. In this malignant condition the clinical history of previous melanoma and the presentationThis glossary term has not yet been described. of multiple new blue lesions are relevant for the differential diagnosis. Tattoos used in radiotherapy and by cosmetics reasons exhibit a blue coloration that in dermoscopy is composed by blue dots that can be distinguished of the blue homogeneous pigmentation of blue nevi. Vascular lesionsThis glossary term has not yet been described. exhibit a typical dermoscopy pattern with red, blue or purple black clods without vascular features. However some vascular lesionsThis glossary term has not yet been described. be exhibit a blue homogeneous pattern. ManagementThis glossary term has not yet been described. Blue nevi are benignis any condition that is harmless in the long run lesions and no treatment or follow-up is needed. The history of recent change or the evidence of increase in size or change in structure demonstrated by digital follow up is the clue for not missing melanoma blue nevus like. Malvehy,j, Puig S, Braun R,et al. Handbook of dermoscopy. Taylor and Francis 2009. Granter SR, McKee PH, Calonje E, Mihm MC, Busam K (March 2001). "MelanomaThis glossary term has not yet been described. associated with blue nevus and melanoma mimicking cellular blue nevus: a clinicopathologic study of 10 cases on the spectrum of so-called 'malignant blue nevus'". Am. J. Surg. Pathol. 25 (3): 316–23. PMID 11224601. doi:10.1097/00000478-200103000-00005. Cabral ES, Chen FW, Egbert BM, Swetter S. Acquired blue nevi in older individuals: retrospective case series from a Veterans Affairs population, 1991 to 2013. JAMA Dermatol.;150(8):873-6. Loghavi 1, Curry J1, Torres-Cabala CA, Ivan D1, Patel KP, Mehrotra M, Bassett 3, Prieto VG1, Tetzlaff MT. Melanoma arising in association with blue nevus: a clinical and pathologic study of 24 cases and comprehensive review of the literature. Mod Pathol.;27(11):1468-78. Daltro LR, Yaegashi L2, Freitas RA, Fantini BC, Souza C. Atypical cellular blue nevus or malignant blue nevus? An Bras Dermatol.;92(1):110-112. Jonjić N, Dekanić A, Glavan N, Prpić-Massari L, Grahovac B. Cellular Blue Nevus Diagnosed following Excision of Melanoma: A Challenge in Diagnosisis the identification of the nature and cause of a certain phenomenon. Diagnosis is used in many different disciplines with variations in the use of logic, analytics, and experience to determine "cause and effect". In systems engineering and computer science, it is typically used to determine the causes of symptoms, mitigations, and solutions. Case Rep Pathol. 2016;2016:8107671. This page was last modified on 31 August 2017, at 10:09.